A sophisticated red eye removal program and general purpose photo editor. Includes circular/elliptical eye selection tool, smooth redness removal, adjustable eye brightness, pupil brightness and eye color. Replacement eye option for severe cases. S10 RedEyes is a sophisticated red-eye removal program that also functions as a general purpose photo editor. It features a circular/elliptical eye selection tool - not rectangular as in other programs - and it smoothly removes redness, with pixel blending along the perimiter (anti-aliasing). 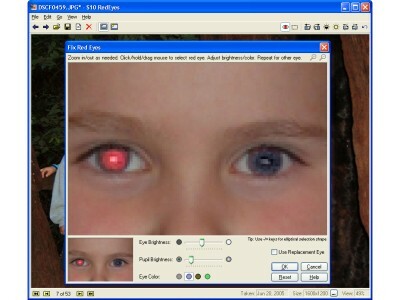 Eye brightness, pupil brightness, and eye color are all adjustable. For severe cases where the flash has entirely wiped out the structure of the eye, a "replacement eye" option is available. General photo editing capabilities include rotating, resizing, cropping, adjusting brightness, and correcting tilt. A navigation toolbar makes it easy to cycle through all photos in a folder. S10 RedEyes is digitally signed, compact (238KB), inexpensive ($9.95), and easy to use.